Step by step video build here! Step by step build article here! The Armstrong Whitworth A.W.38 Whitley was one of three British twin-engine, front line medium bomber types in service with the Royal Air Force at the outbreak of the Second World War (the others were the Vickers Wellington and the Handley Page Hampden). It took part in the first RAF bombing raid on German territory and remained an integral part of the early British bomber offensive until the introduction of four-engined "heavies". Its front line service included maritime reconnaissance with Coastal Command and the second line roles of glider-tug, trainer and transport aircraft. The aircraft was named after Whitley, a suburb of Coventry, home of one of Armstrong Whitworth's plants. 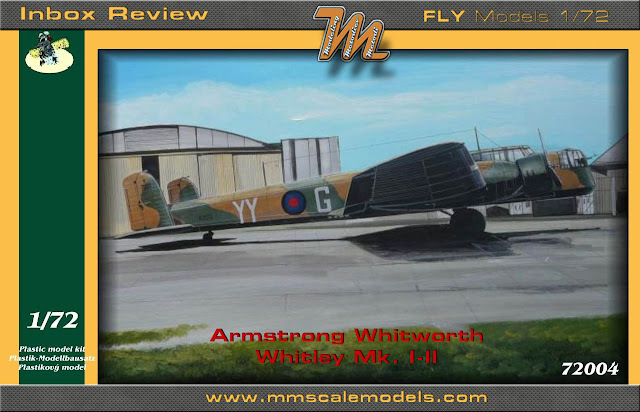 The AW Whitley .38 Kit N 72004 from 2014 is rebox from their initial release from 2011. Everything is packed in side opening box with nice boxart. Inside all is in one plastic bag with the transparencies, resin parts and photo etched parts in separate bags. There are four plastic sprues in total, one of which is in clear plastic. Kit provides a lot of resin details and a small photo etched fret. They are A5 (ish) size and fairly complicated. Page one shows two profiles of the aircraft, the parts breakdown and colors legend. Colors are given in generic names. Generally with enough attention there should not be any issues. A bit of a shortcoming is the fact that assemblies which are optional for the different versions are marked with "?" but it is not stated which option concerns which version. So some research will be necessary. Decals also come in A5 size sheet. They are in register and glossy. Carrier film is trimmed very close to the actual markings and seems to be with good thickness. Armstrong Whitworth Whitley Mk.I, K7219/10-D of No.10 squadron RAF in 1938, Dishfort airfield, North Yorkshire. Armstrong Whitworth Whitley Mk.I, K7200/78-V of No.78 squadron RAF in 1938, Dishfort airfield, North Yorkshire. Armstrong Whitworth Whitley Mk.II, K7229/OF-A of No.97 squadron RAF in 1940, Armstrong airfield, Berkshire. Armstrong Whitworth Whitley Mk.II ,K7233/51-P of No.51 and 9 squadron RAF in 1938, Lintin-on-Ouse. The injection molded parts come in beige color and one clear sprue. The non-clear parts are super glossy and have no visible surface defects. There is flash present here and there but that's not much of a problem. There are also some ejector pins inside the wings that might need to be removed in order to have good assembly. On the first sprue there are the fuselage halves, engine nacelles, propellers and interior parts. On the second sprue you will find the upper wing parts, the horizontal stabilizers and parts from the undercarriage. The third solid sprue holds the lower wing parts with each wing comprised of two parts. There are also some interior and undercarriage parts as well as the wheels. The clear parts are on one sprue. Here you have the cockpit "greenhouse" canopy, the turrets and other smaller transparencies. There are also eight blocks of resin holding parts for the interior as seats, controls etc, two engines, two main gear wheel wells, MGs, exhaust pipes, propeller hubs etc. On the small PE fret there are the antenna loop, wheel well door hinges and some control surface movement mechanisms. As previously stated the parts are very smooth. The panel lines are very crisp and delicate with minor cases of inconstancy. Where appropriate there is raised surface detail is nicely depicted. The injection molded interior parts are OK for the scale and the internal ribbing structure on the inside of the fuselage halves is very nice. The undercarriage parts are looking good too but I am concerned if they are sturdy enough to cope with the weight. A bomb bay would have been a nice option. Also location aid is not provided everywhere. The transparencies are not to the same level as the rest of the model. While the "greenhouse" canopy is OK the turrets and their surroundings are not. The have heavy orange skin effect and I am not sure on which side it is molded in. If it is on the inside then in might be curable with some careful sanding and polishing. On the other hand the framework is really nice. It is fine and thin yet prominent enough to help masking which it this case will be labor intensive process. Holes on the fuselage for the smaller transparencies are not present and not all of the small windows are actually meant to be fitted on all versions so check your references. The resin parts will add significant amount of detail to your scale model. The interior will be spiced up with seats with molded in seatbelts, a table, control column and some nice MGs if you choose one of the turreted versions. There are two really nice Armstrong Siddeley Tiger radial engines accompanied by beautiful propeller hubs. Along with them there are exhaust pipes, air intakes and radiators that goon the nacelles but You'll have to check your references which option had them. The main wheel wells are also very well made. The contents of the PE fret will add the finest details to give the model that true to scale appearance. This kit is well made and will be excellent foundation for a great scale model of the Armstrong Whitworth Whitley. Yes there are a few hiccups (mostly the transparencies) but with a little bit of work and care the final result should be excellent. I would't recommend this kit for the beginners because it definitely demands some experience but for those of us who have some builds behind our backs I think it is highly recommended.